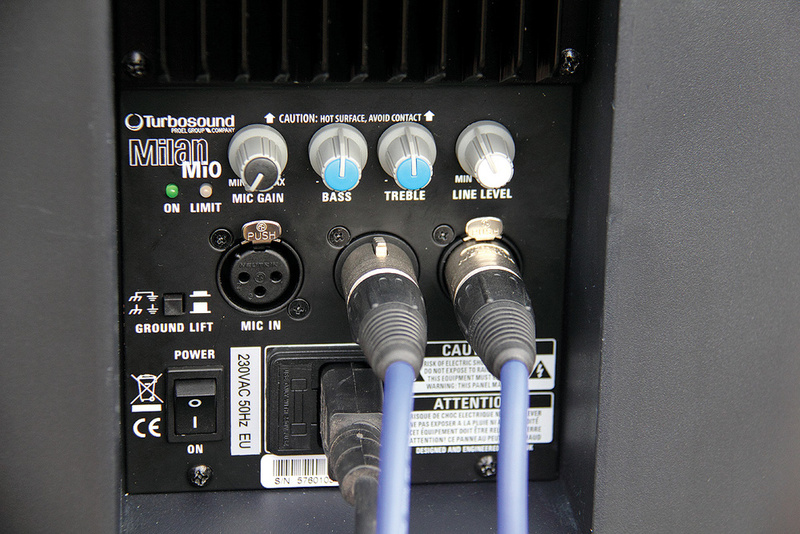 The Turbosound Milan Mi0 enters a competitive market. Can this little newcomer stand out from the crowd? The recently‑introduced Milan range of portable self‑powered speakers from Turbosound consists of three models, and comprises 10‑inch and 15‑inch two‑way, full‑range powered speakers and a powered 18‑inch subwoofer. The new baby£ of the family is the 10-inch model, the Milan Mi0, which we're looking at here. There's a wide choice of self‑powered speakers on the market these days. Smaller units with eight- and 10‑inch woofers can be found everywhere from garden fetes to upmarket bar installs, so any newcomer needs to have some sort of differential in order to attract attention, whether it be price, power or portability, for example. The Milan Mi0 has two advantages right out of the box, in that it says 'Turbosound' on the front, which is always a nice thing to have written on one's live gear, and it's a bit of a looker. Whatever it contains inside and whatever the performance figures say, the Mi0 is a stylish little item that's very pleasing to the eye. I'm generally a fan of plain, square‑ish black speaker cabs, as much of my work involves corporate clients who want to hear the sound but don't wish to know where it comes from, but my first impression on unwrapping the Mi0 was that it would be at home at any posh product launch or business presentation. The attractive cabinets are made from the ubiquitous polypropylene using a gas-injection moulding process. As I understand it, this involves the use of nitrogen gas under pressure to counteract shrinkage during cooling of the moulded material, producing an accurate shape and a nice surface finish. Apart from the stylish dark-blue colour, which Turbosound call 'black‑blue' and is specific to the Milan range, the moulding is clearly of high quality, including fine ribbing down both sides, as well as crisp, sharp detailing. Since everything is moulded into the enclosure itself, there are few bolt‑on parts to rattle or work loose over time, and the review models certainly didn't make any untoward noises when bumped around on a hard surface. On top of the cabinet, there is a single 'scoop' handle that offers a secure grip and is quite adequate for lifting the Mi0, which weighs less than 12kg. The Mi0 is symmetrical, and you can treat either edge as the top or bottom when you're using the speaker as a floor monitor. This allows a choice of where the high-frequency (HF) end is located, which is useful for very close or individual monitoring applications, such as an orchestra pit with very limited space. For 'flying' or permanent installations, M10 rigging points are provided on the top and bottom, so the cabinet can be positioned vertically or horizontally. Working with portable speakers at a range of venues, I value the quality of the metal front grille, as it tends to take a lot of punishment and is, of course, what the punters/clients will see most of. The Mi0 has a strong galvanised-steel grille with a matte silver, powder-coat finish. The grille sensibly covers the whole front of the cabinet and derives good rigidity from its folded edge shape where it fits tightly, securely and neatly into the bodywork. It serves as an example of just how well this cab is put together that there are actually no fixing screws holding the grille in place, it's just a very accurate push fit and would have to be carefully prised out if necessary. There's no foam liner inside the grille, and it's possible to see the driver components inside, but the punched metalwork should offer reasonable protection against the odd accidental spill or splash. I like how the rear of the cabinet extends way back beyond the control panel, providing a level of protection for the controls and heat-sink fins that's much better than usual. This is an excellent design point. On the bottom of the cabinet, there are three fairly soft, grippy rubber feet of good size, which are far better than the hard plastic scratch‑n‑slide things favoured by some manufacturers. The pair of pole-mount sockets provides a choice of mounting angle: the speaker can be mounted so that it faces directly forward at a right angle to the ground, or it can be angled downwards at the audience. In most smaller indoor venues, the latter would be the one to go for, as the sound is aimed at its intended target and the dispersion of the horn will still ensure that a decent balance is achieved for those at the back. The rear panel of the Mi0 is quite simple, including high and low shelf EQ and a simple mixer for the line and mic inputs. It's also well protected by the extended rear of the gas‑moulded cabinet. 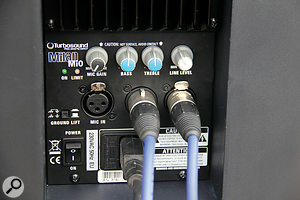 The Mi0's amplifier module is housed in the back of the cabinet, with a control panel below it. The power-amp section includes a 180W (continuous) class‑D low‑frequency amp and a 50W class A/B design for the high frequencies. Drivers are a specially‑designed, reflex‑loaded neodymium 10‑inch woofer and a one‑inch compression driver mounted on an elliptical waveguide, resulting in 90 x 60 degree high‑frequency dispersion. The overall frequency response is quoted as 55Hz to 22kHz at ‑3dB. The rear panel hosts all the connectors, controls and indicators. Everything has been kept simple and straightforward, and the panel layout is easy to understand at a glance for users who may be unfamiliar with this type of gear. There are two XLR inputs, microphone and line, which have independent level controls and can be mixed. The line-input XLR is also able to accept balanced or unbalanced jack plugs, which is handy for solo performers or situations where an external mixer isn't needed. I tried using the Mi0 as a keyboard amp, and it performed very well. The mix output that's sent to the internal amplifier section is also duplicated by a balanced XLR line output, for onward transmission to another cabinet or audio destination. The Mi0 includes a simple two‑band shelving equaliser with center‑detented pots. As the manual suggests, they're useful when applying a bit of bass (and maybe treble) cut in a floor monitor application. Switching the Mi0s on is an undramatic and quiet process, with a couple of very small clicks as the LF and then the HF sections come to life. Switching off and on again quickly didn't produce any unwanted pops, and any idling noise comes mainly from the LF section, with very little hiss from the horn. Overall, the noise level while idling is low, and acceptable for performance applications, though it might be distracting in a very quiet environment. I compared it to two other active speakers from well-known manufacturers, and found that the Mi0 produced much less noise than one and slightly less than the other. The SPL quoted in the published specification is 119dB continuous with 125dB peak output, and I can confirm that these little speakers definitely pack a lot of wallop. I hooked them up with and without a subwoofer; in full-range mode they had a surprisingly full sound with plenty of warmth and depth, and I didn't find the sound fatiguing even at high levels. When pushed hard, they simply delivered more output, and remained well‑balanced, like a pair of powerful monitors. At low volume levels, there was still plenty of warmth to the sound and, for me, their real forté was clarity and projection in the vocal range. When I ran the pair of Mi0s with the Milan M18 subwoofer, I was able to produce even higher overall levels of volume, as the Mi0 speakers were concentrating all their power on the high‑passed signal fed from the sub (everything above 80Hz or 125Hz, depending on the M18 setting), rather than wasting power trying to reproduce the lowest frequencies. Despite their small size, the Mi0s do make a respectable rig at very high levels when paired with a decent sub! I took a single Mi0 outside for an open‑air speech test in a field, pointing away from any buildings, and it performed impressively, covering a much greater area than I had expected. I was also able to use the speakers in a rehearsal for amplifying male and female vocals over a 20‑piece band. I'd definitely put them in the top flight of powered portables for this task. I also used them to reinforce the top trumpet line of the band, both close‑miked and as a section, and was able to produce a natural bright sound that easily cut across without harshness, blending nicely with the natural, un-miked sound of the rest of the band. One of the things I like about Turbosound products is the availability of spares and, should anything go wrong, all the parts (including spare front grilles) are readily available to get your Mi0 back into service quickly and easily. There's a parts list on the web site, together with a technical support service. Also, if you call the company someone will speak to you. Apart from finding a home with musicians, DJs and independent live sound providers like myself, I should imagine the Mi0 will find its way into many upmarket bar installs. Its versatility and power‑to‑weight ratio, combined with the strong design and build, should also fit the rental criteria for speakers of its size. I really like the Milan Mi0 powered speaker. It's an impressive performer, is very well‑constructed, and combines versatile practicality with attractive and individual design and styling. 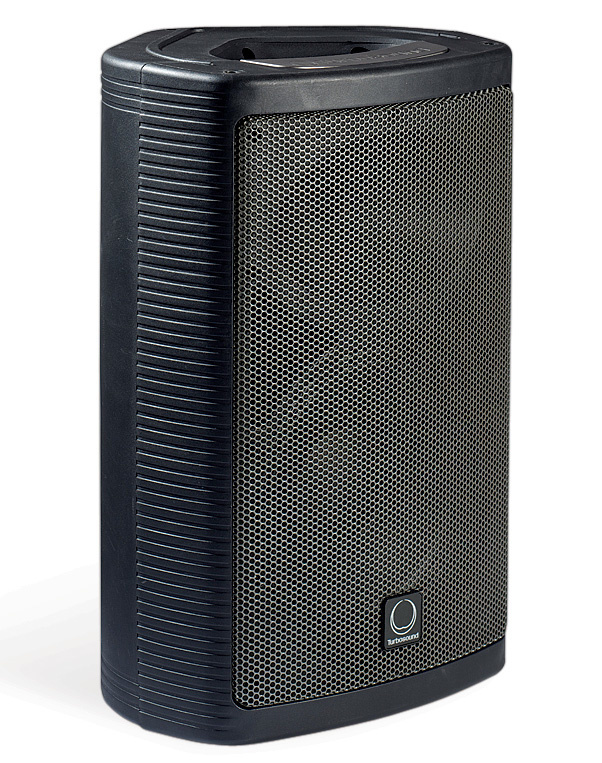 HK Audio's FAST active PA speaker provides a similar level of performance to the Mi0, as do QSC's K8 and K10 K‑Series active Speakers. Technical support and spares available. The Turbosound Milan Mi0 is an extremely well constructed and impressive self‑powered speaker. The cabinet design is practical, yet has a spark of sleek and individual style, and controls are simple to get to grips with. Sound quality and vocal projection are both top class, making this portable speaker a top performer all round.